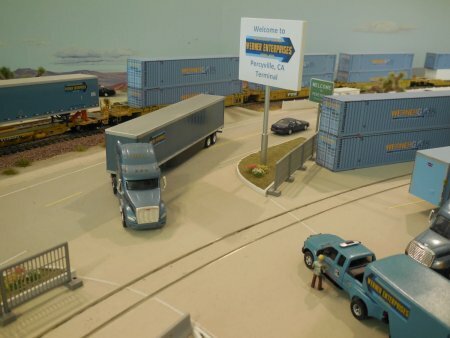 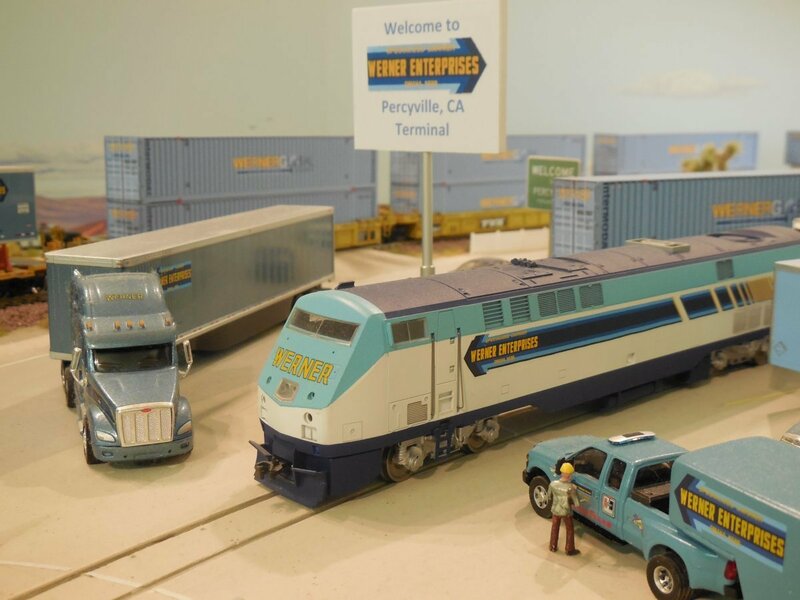 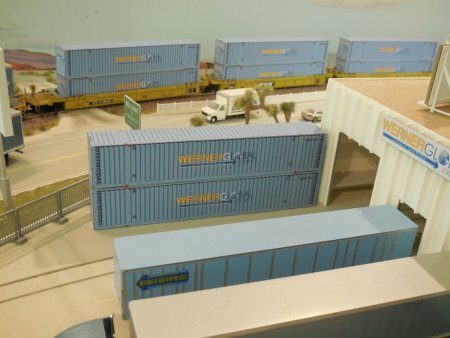 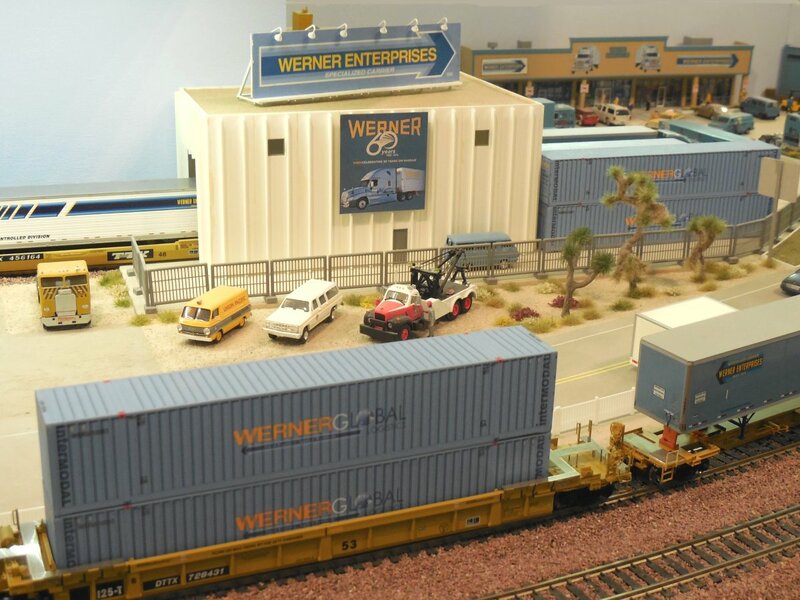 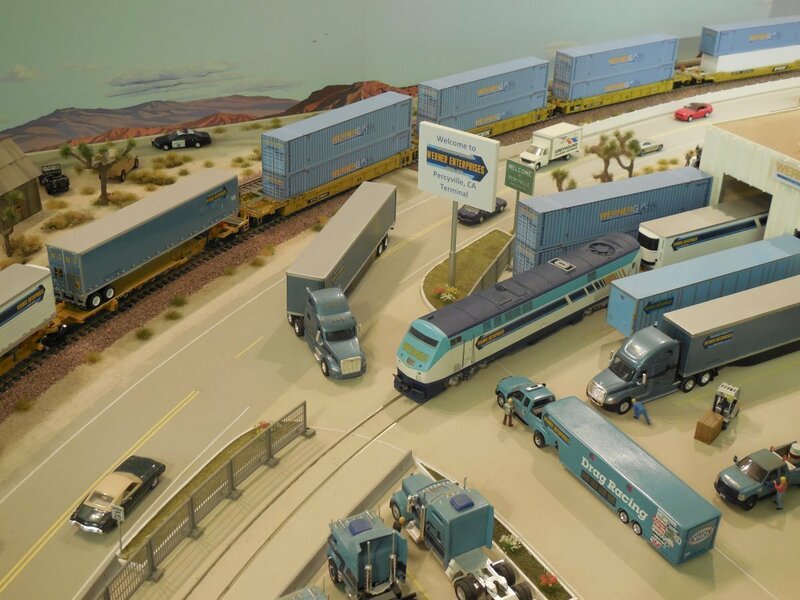 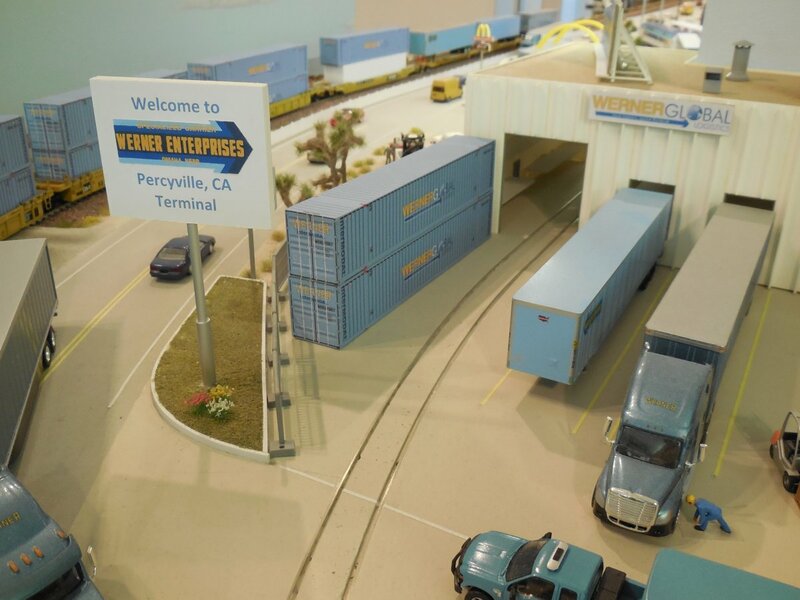 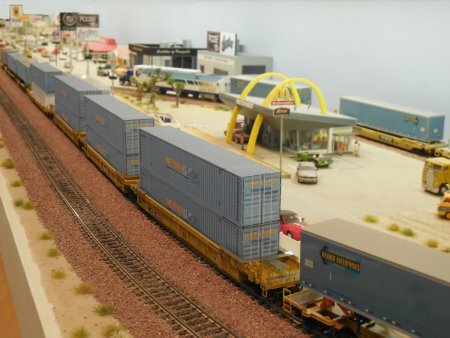 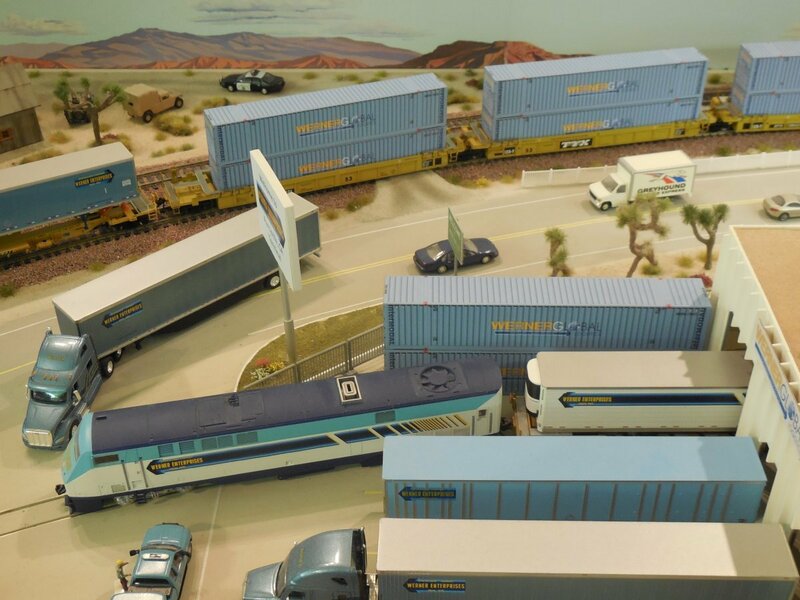 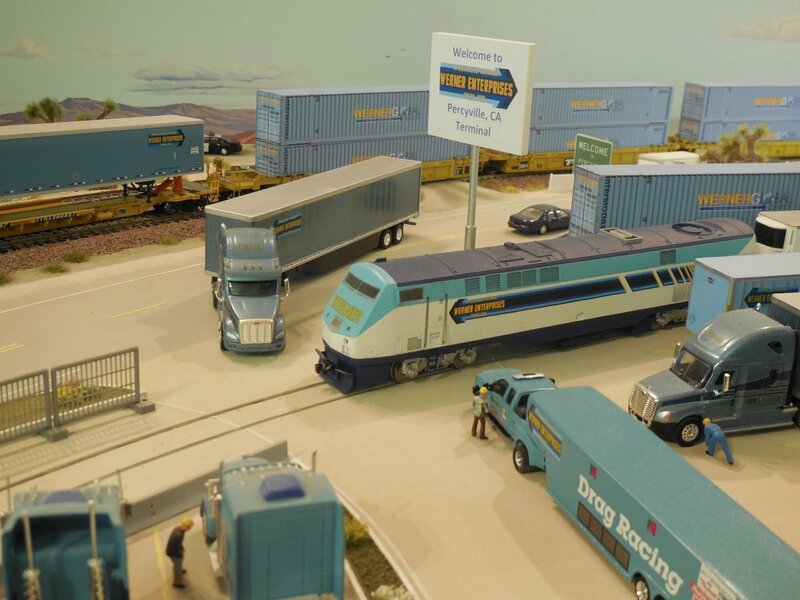 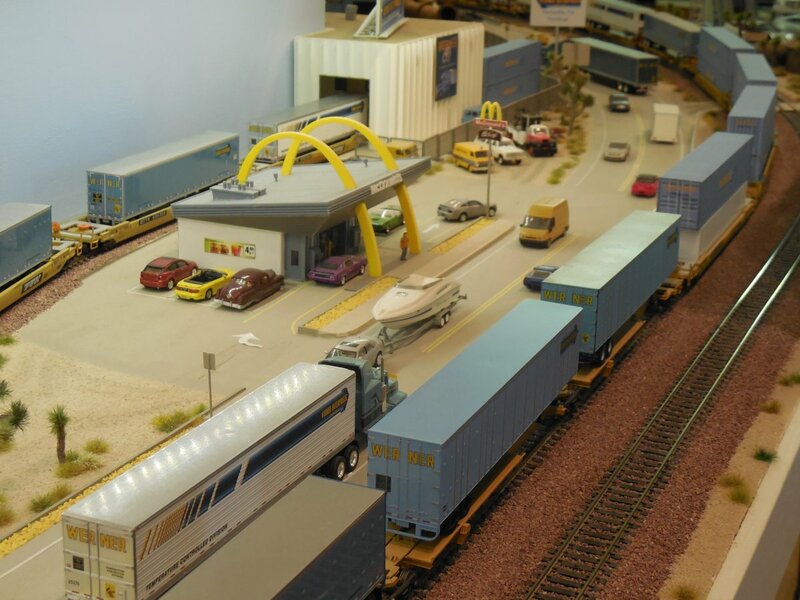 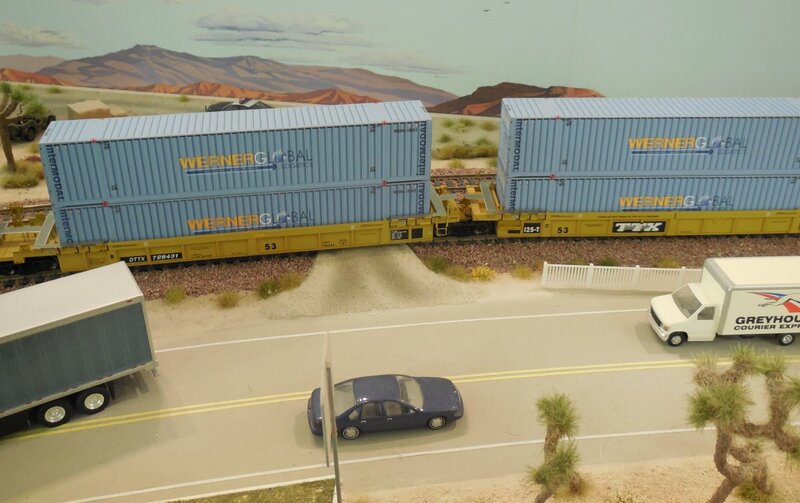 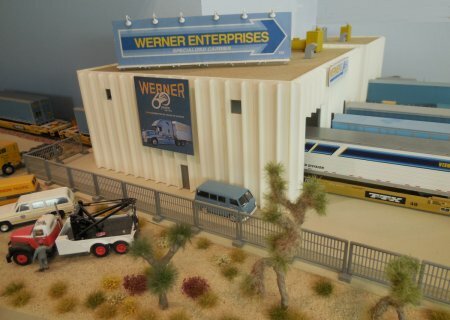 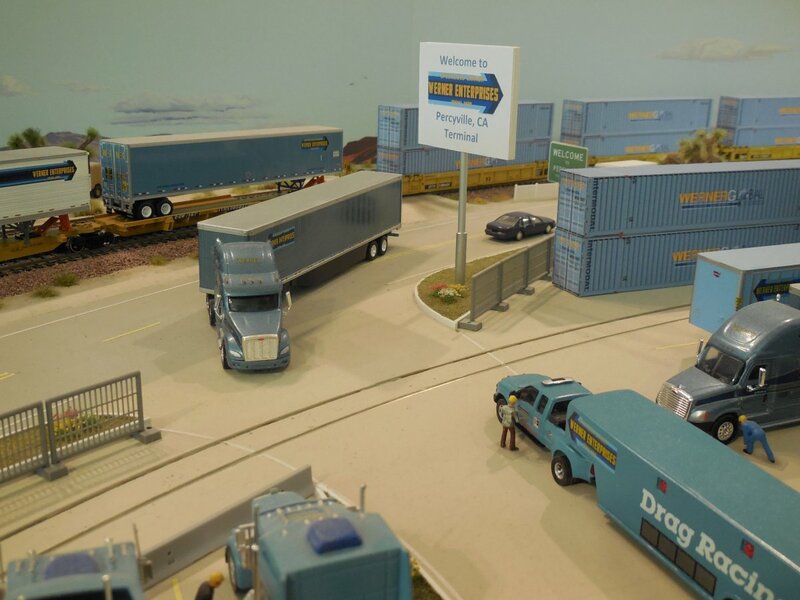 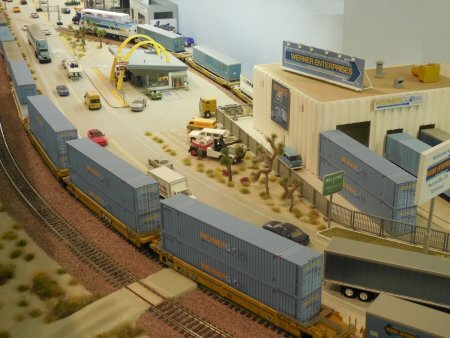 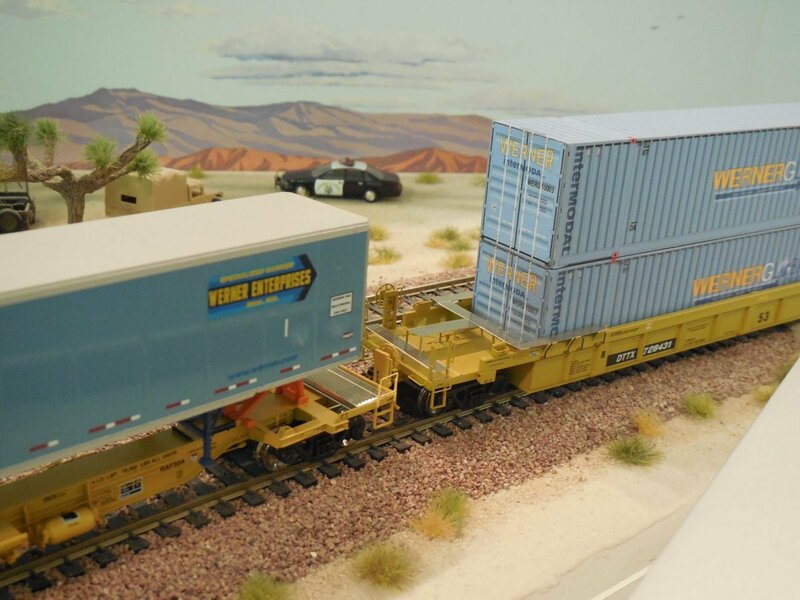 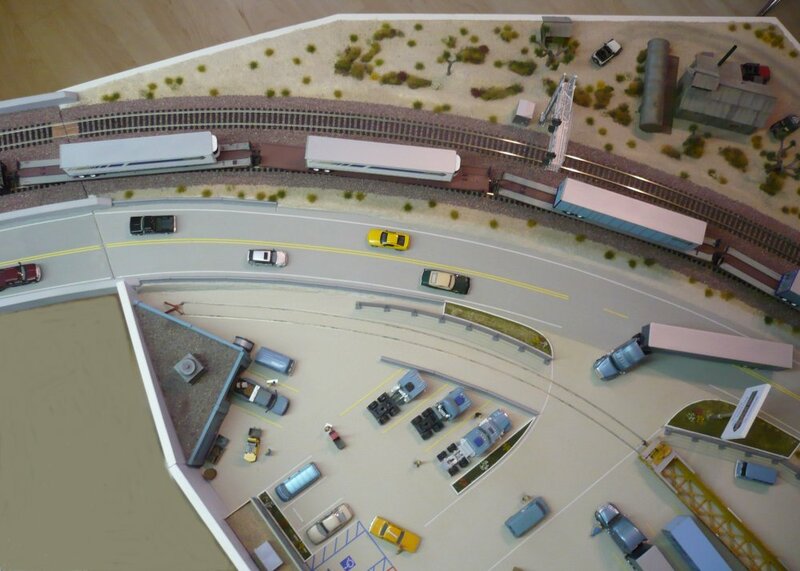 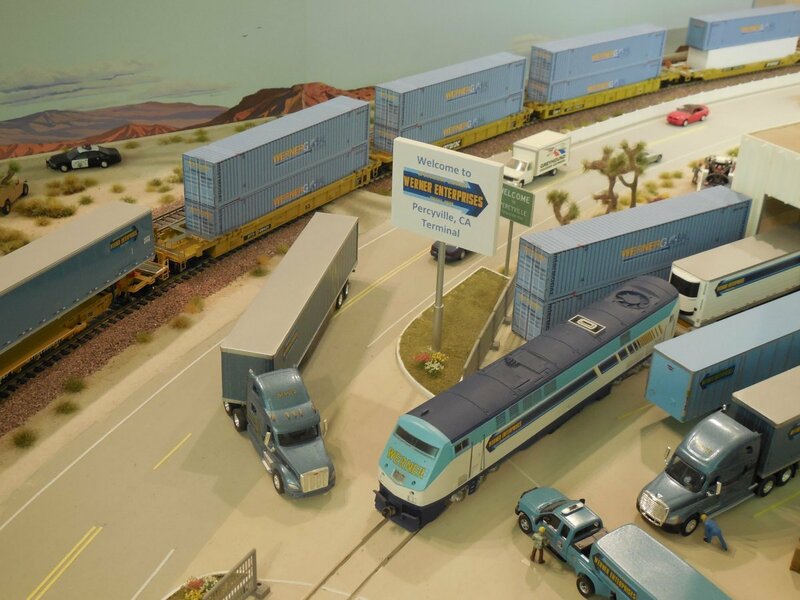 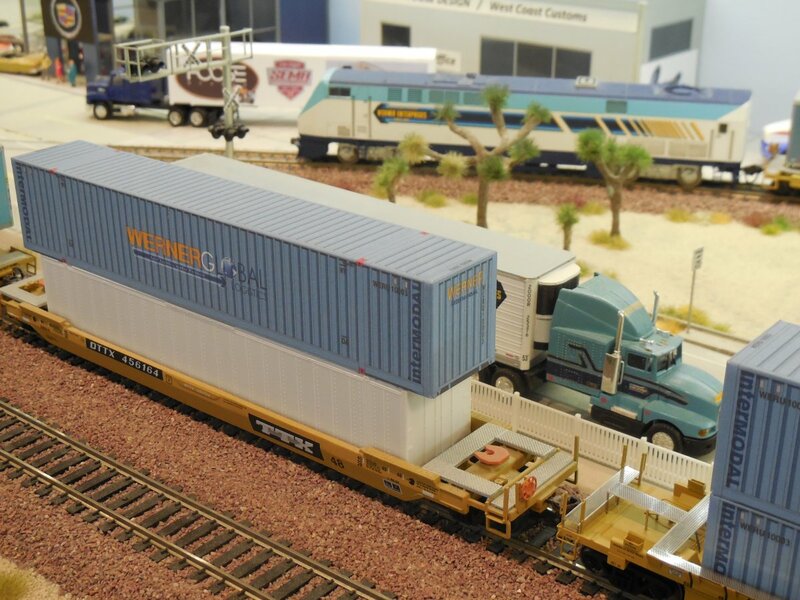 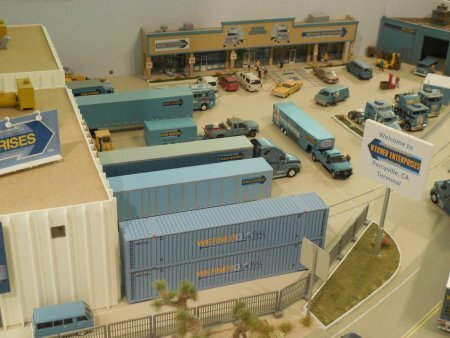 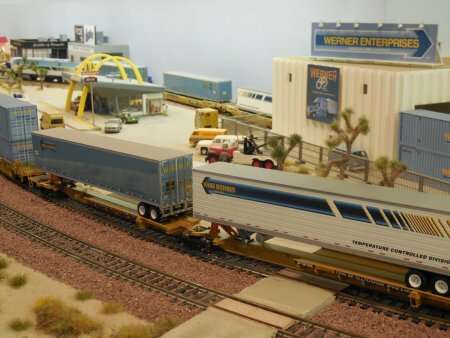 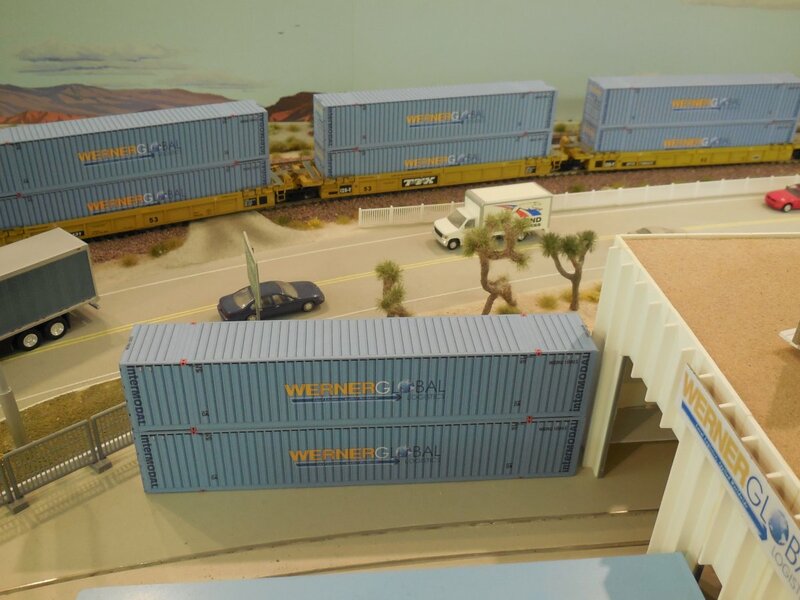 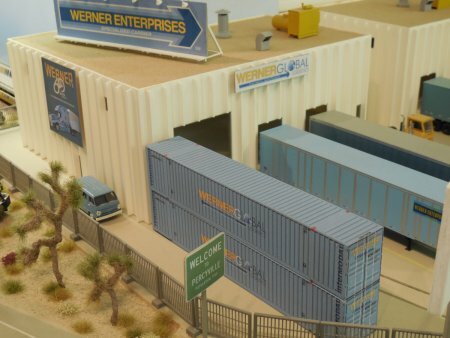 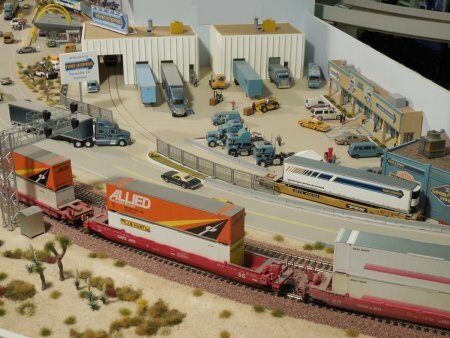 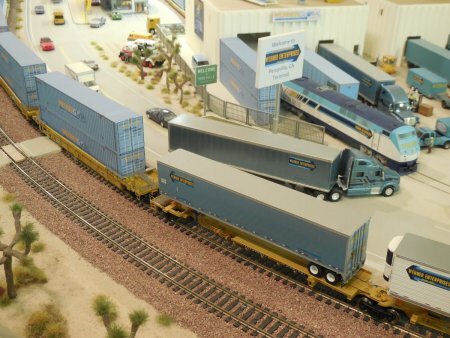 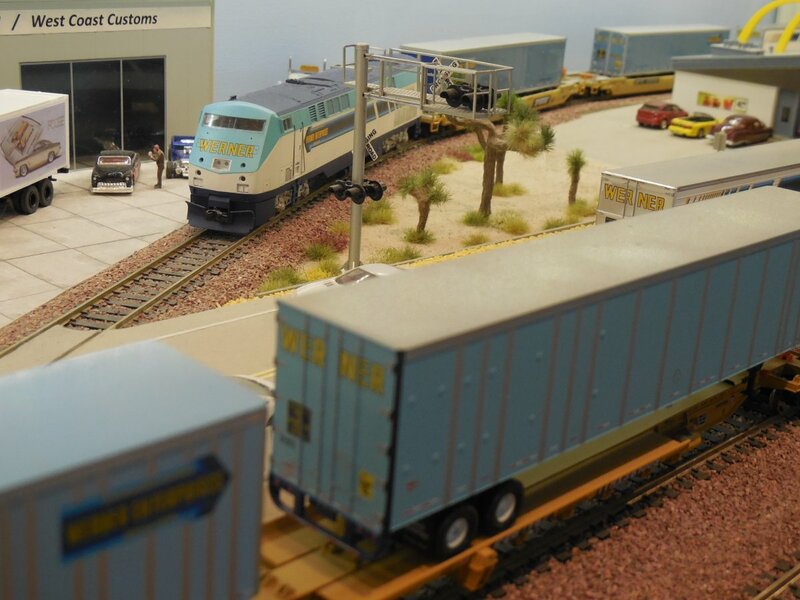 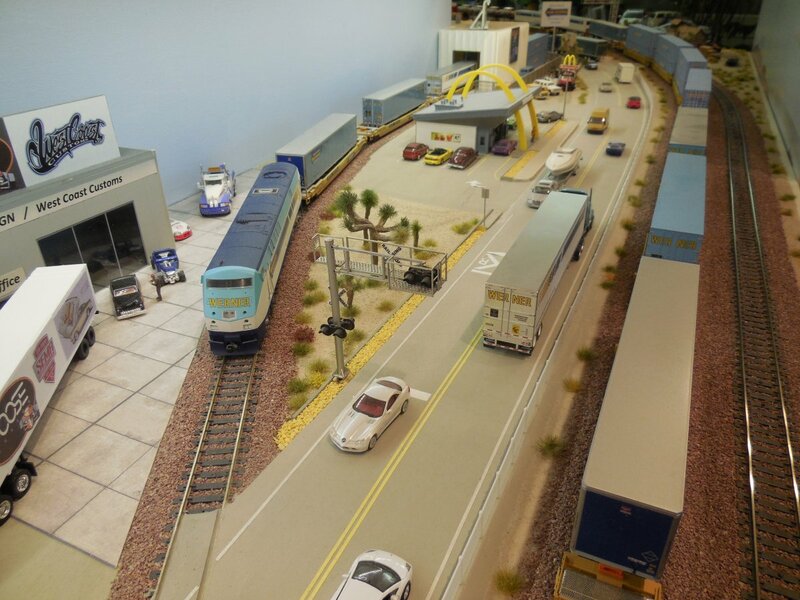 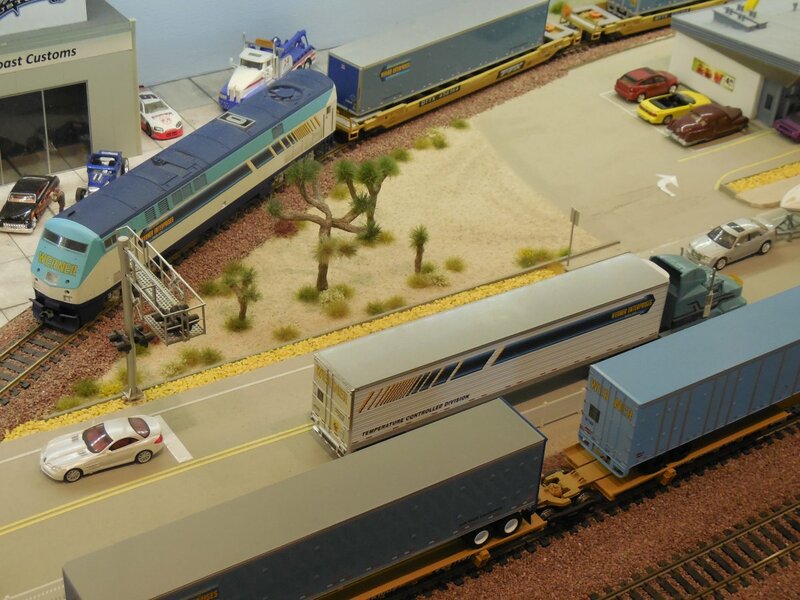 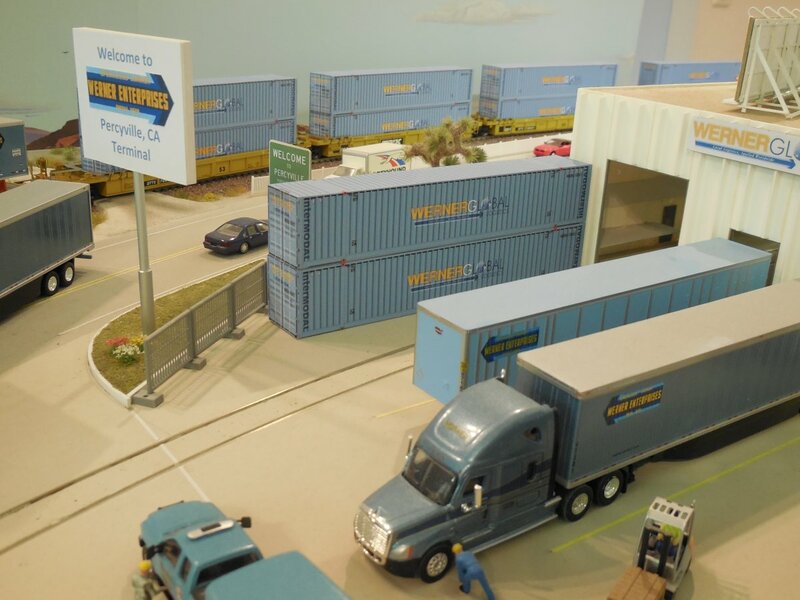 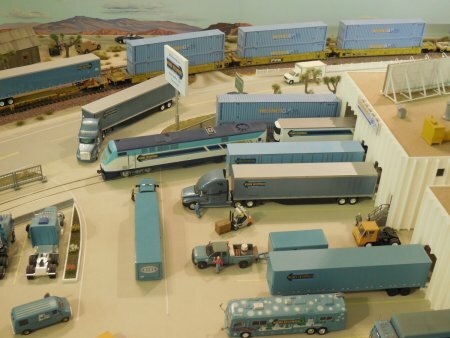 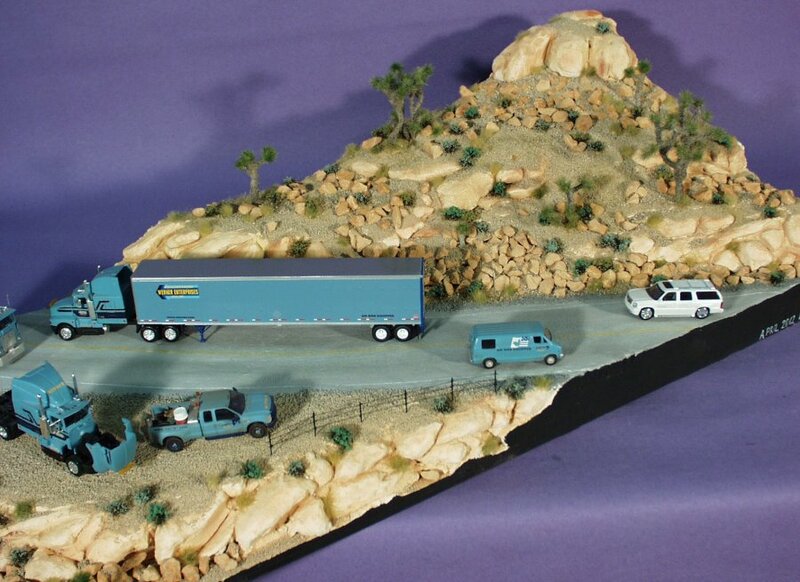 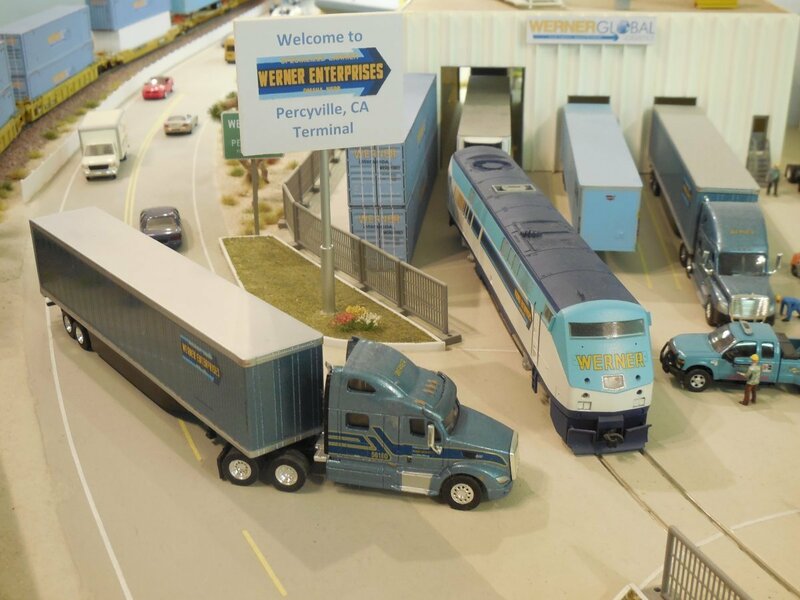 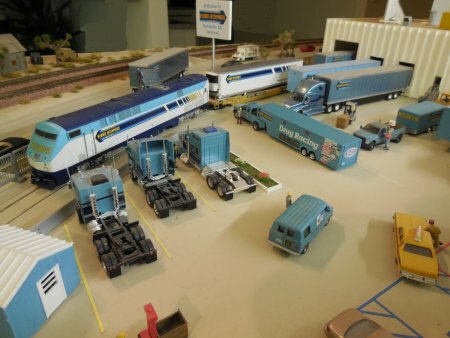 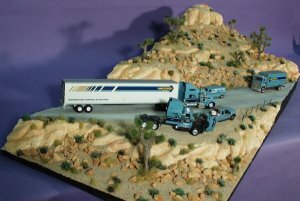 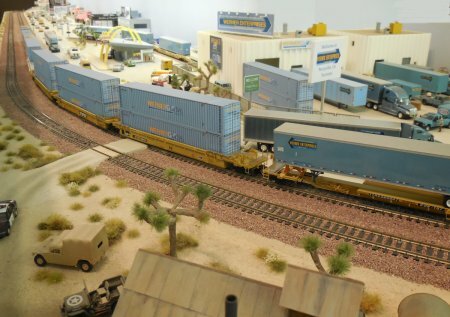 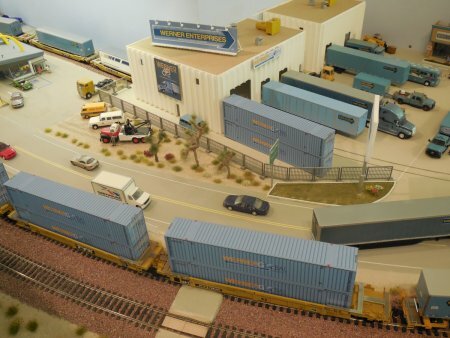 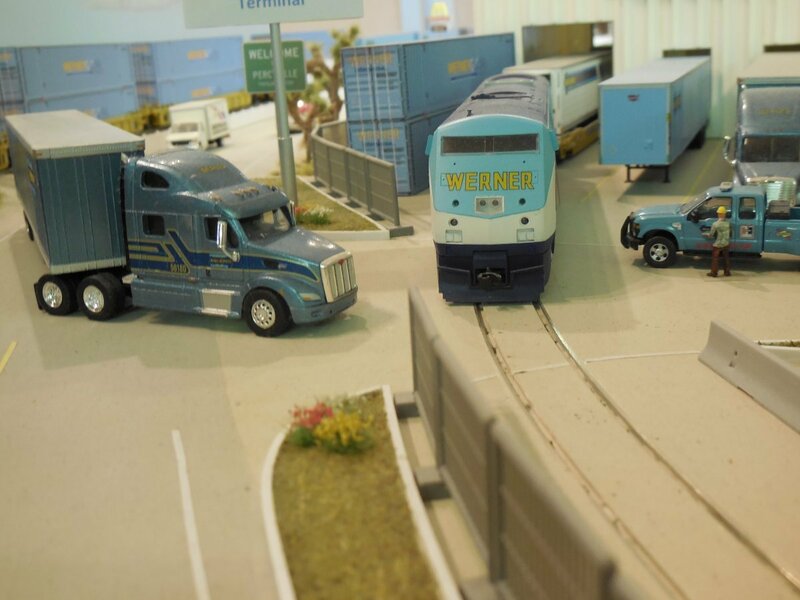 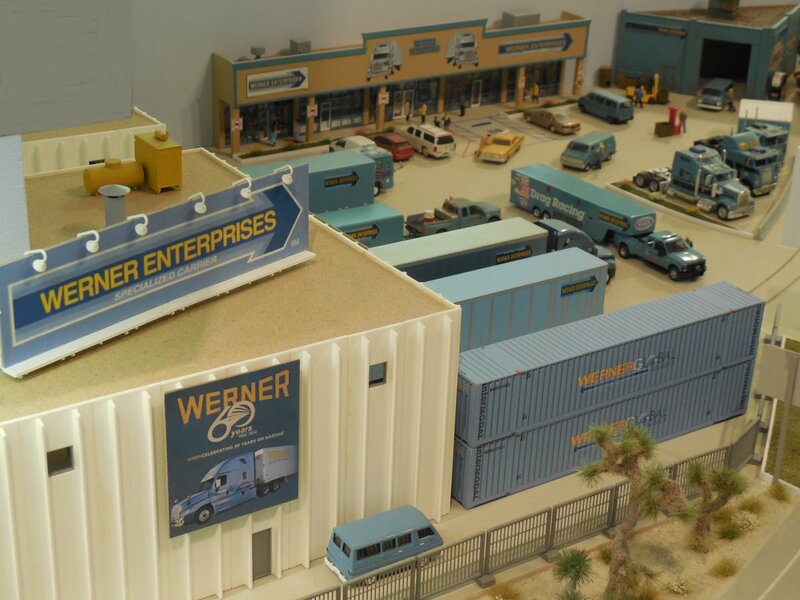 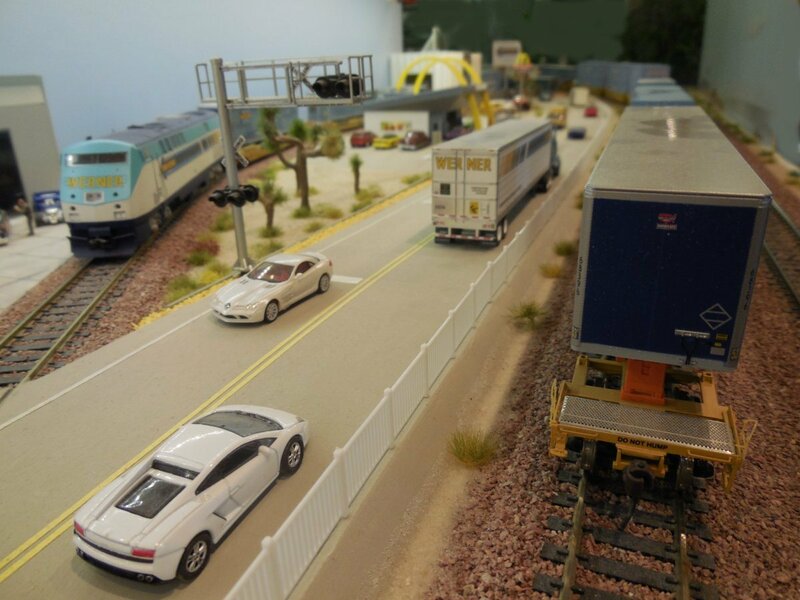 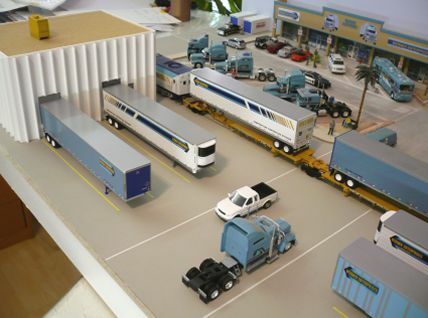 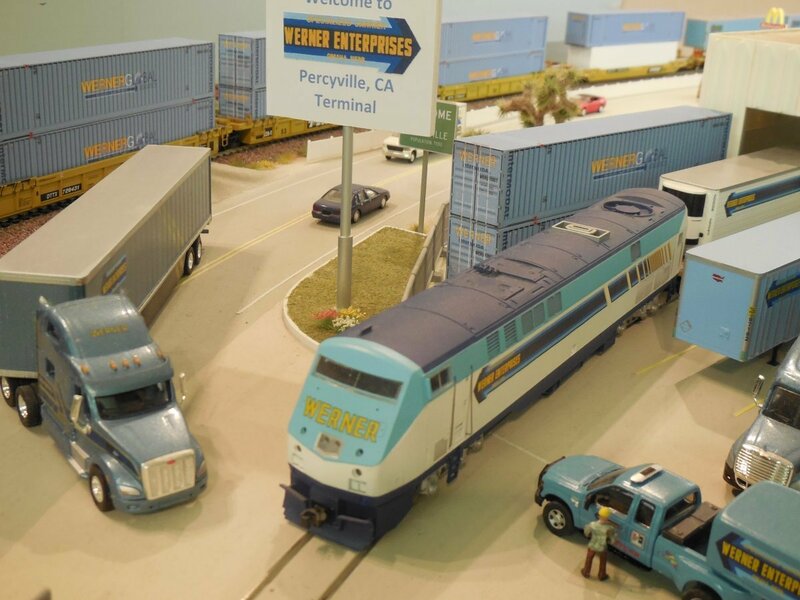 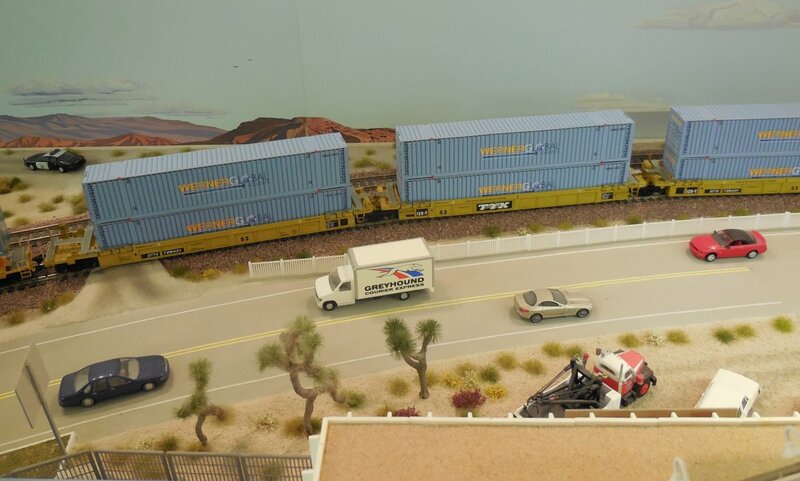 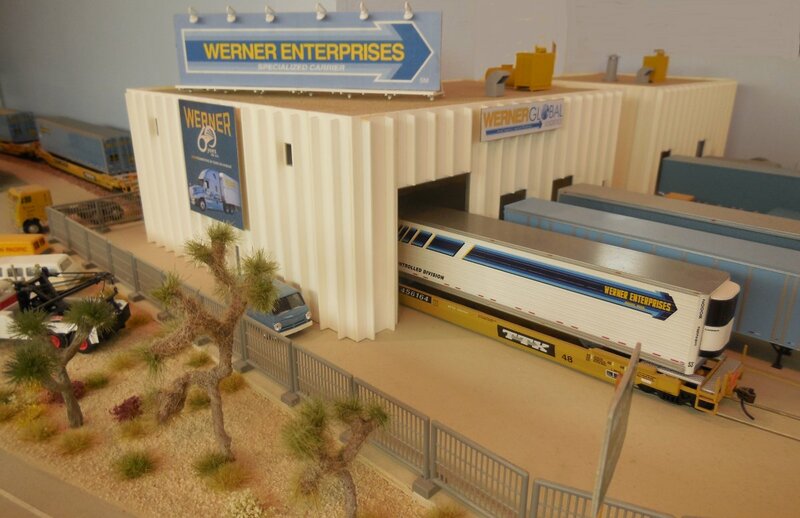 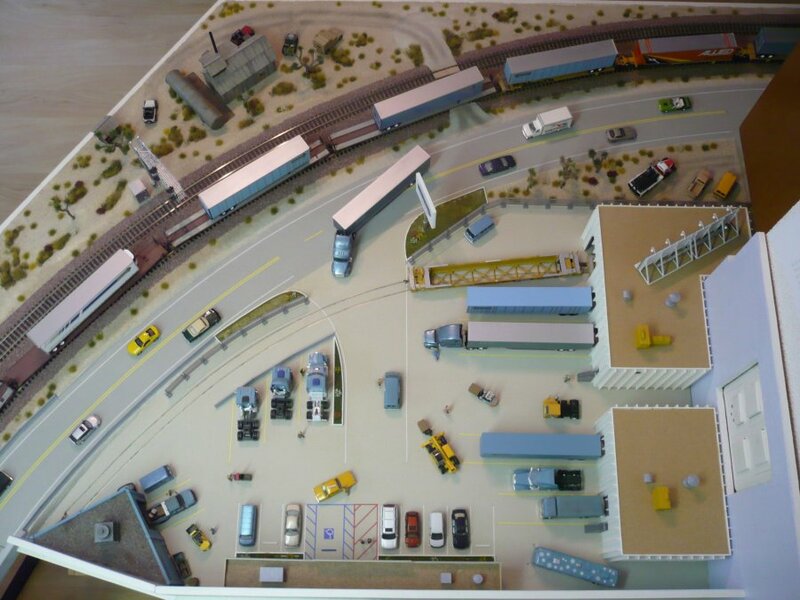 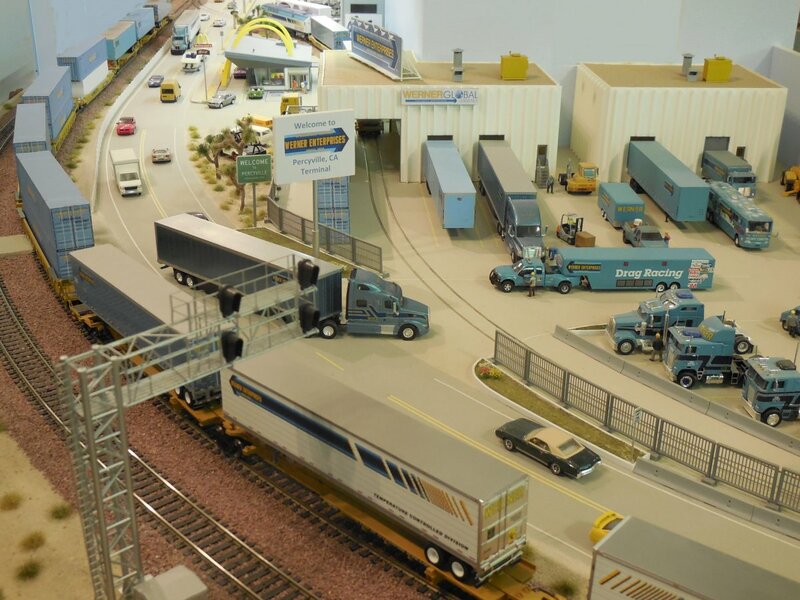 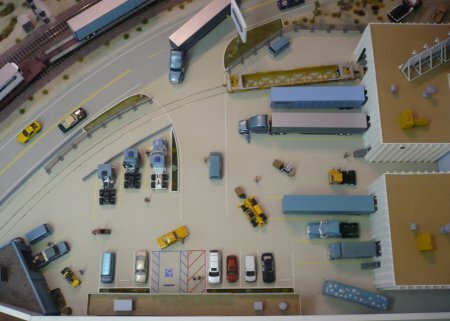 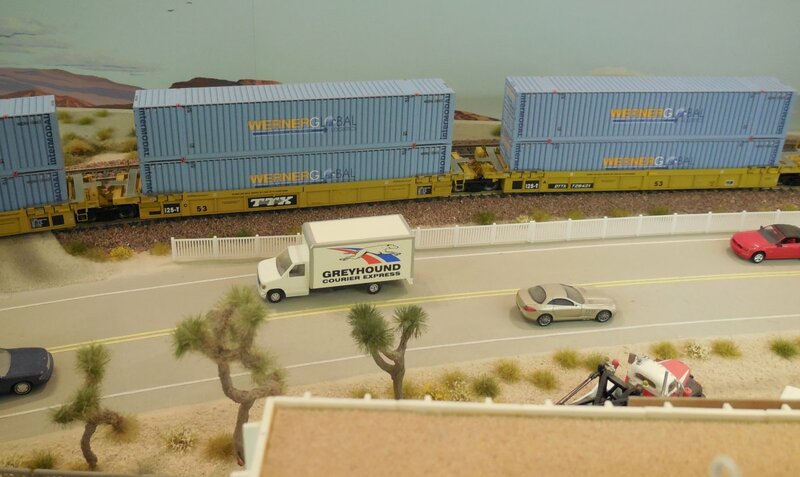 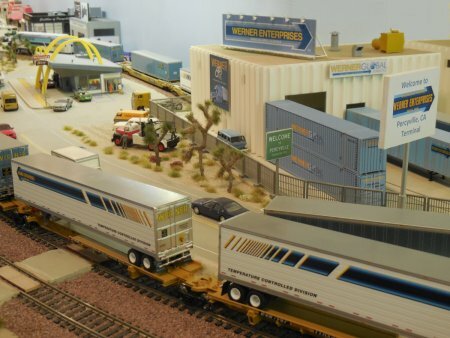 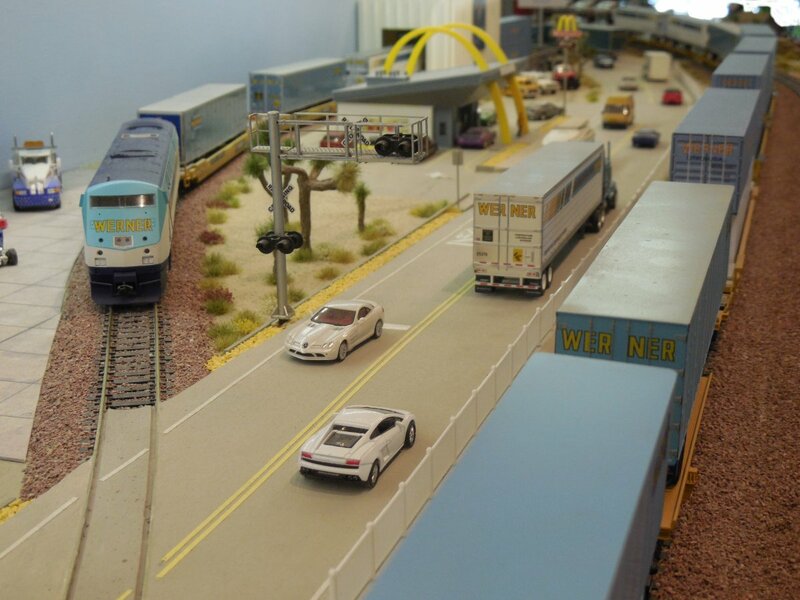 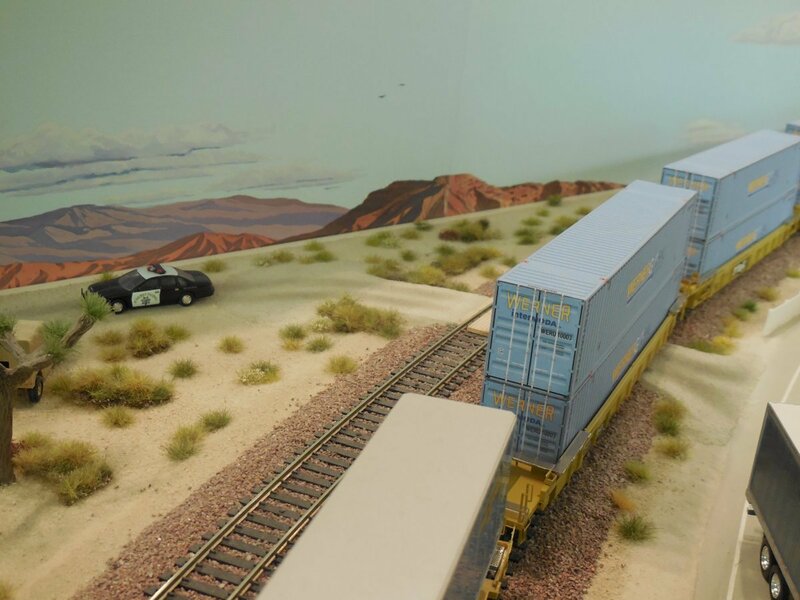 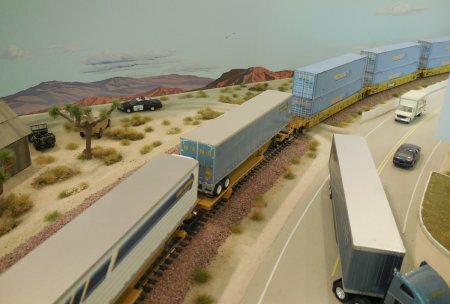 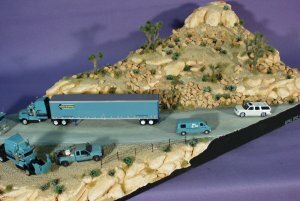 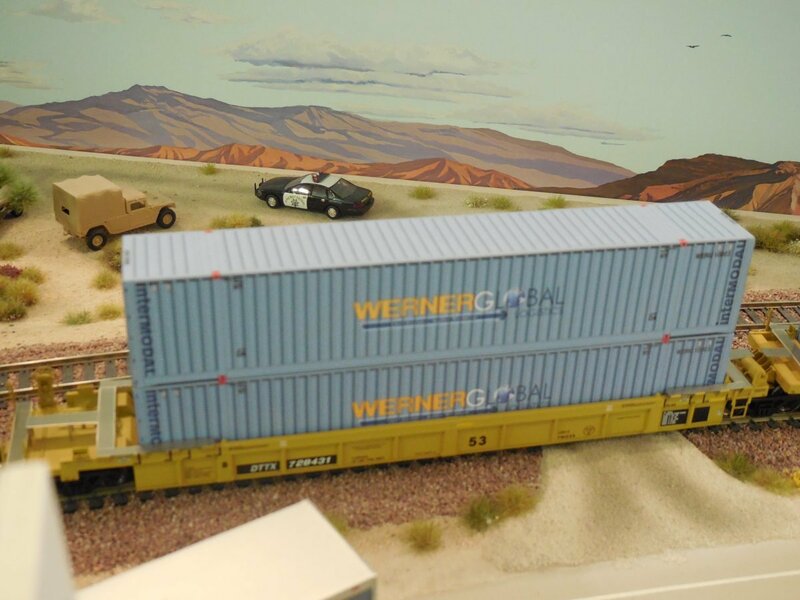 On my Mojave Desert Layout, Werner Enterprises built a Terminal in the City of Percyville. 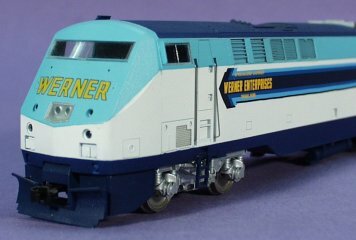 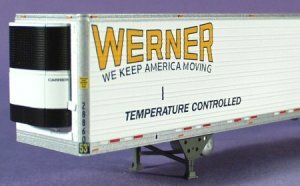 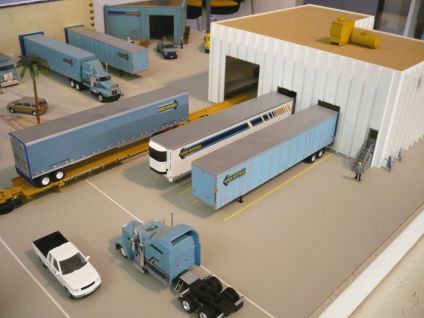 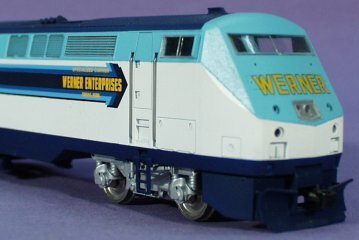 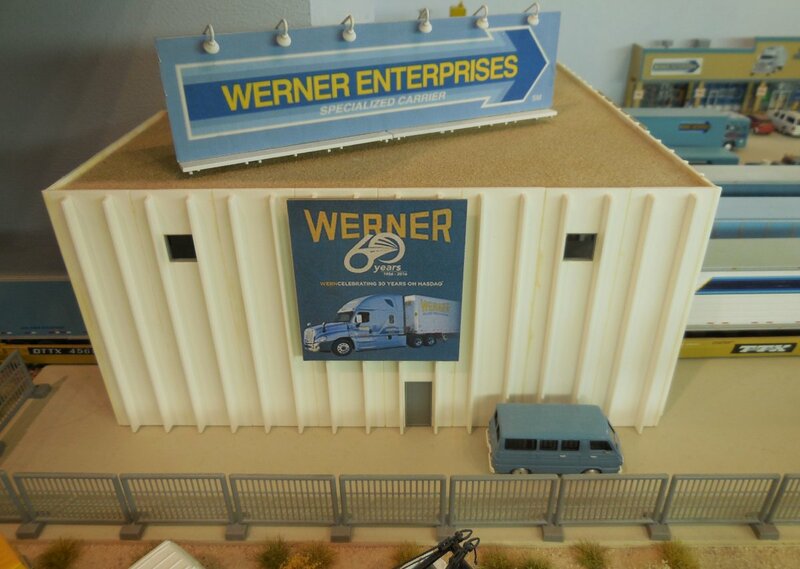 To make it as real as possible, Pitsch Allneider created some one of a kind Werner Enterprises Models. New 53' Container on top of 48' Containet sitting in a double stack well car. 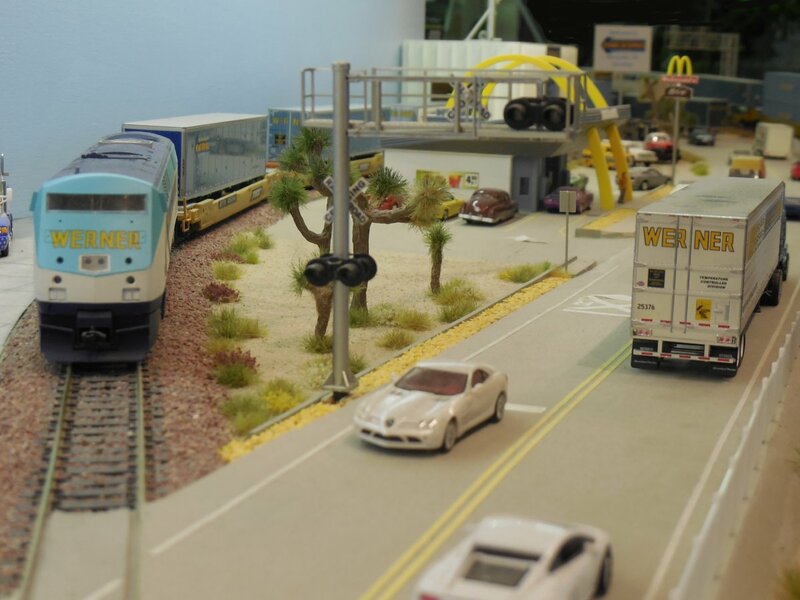 As usual, I am taking a huge amount of photos to show a lot of different views. 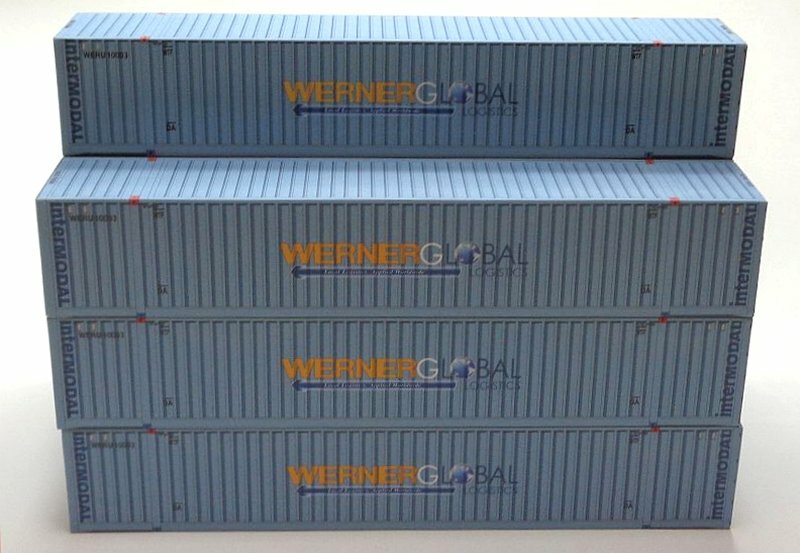 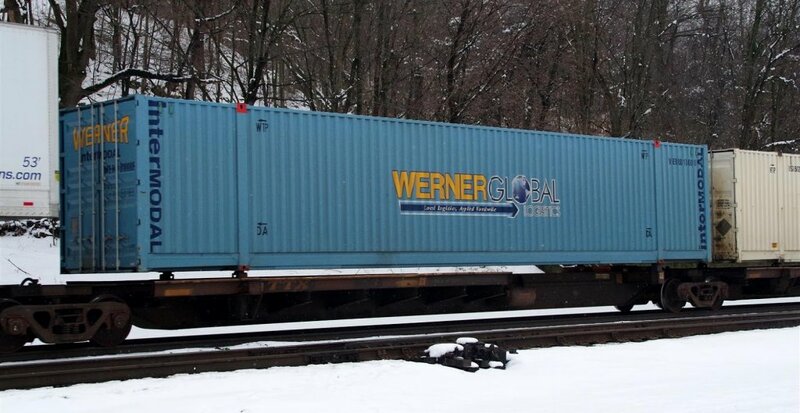 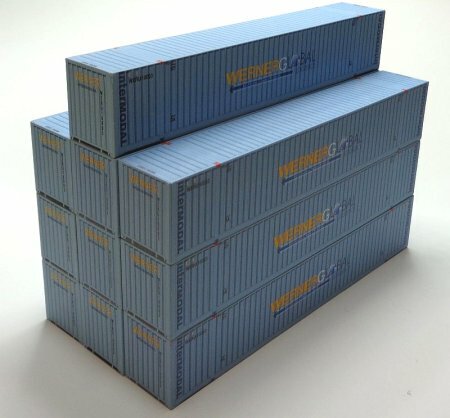 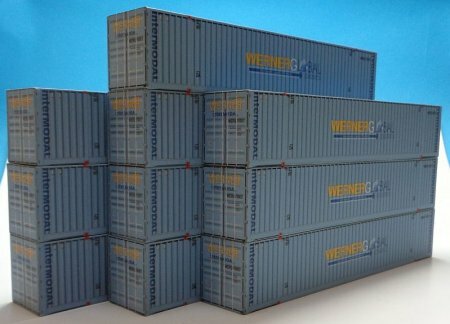 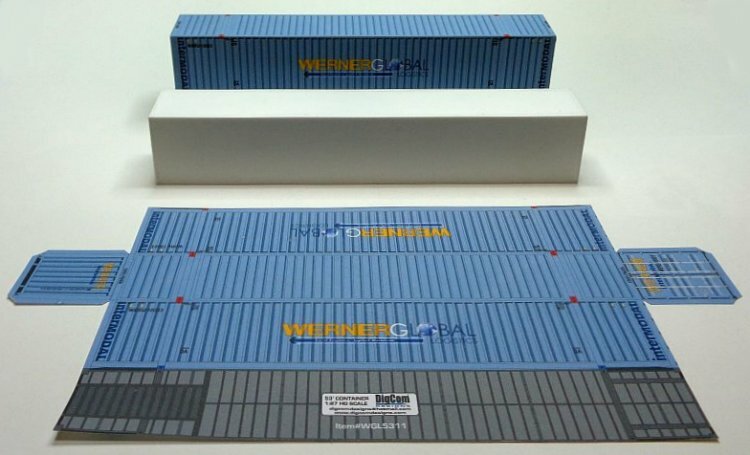 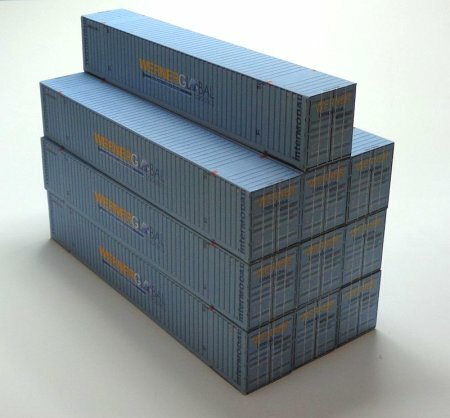 Werner Global Logistics 53' Containers as seen on double stack well cars and spine cars. 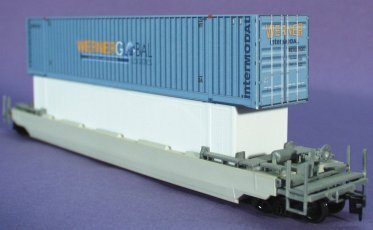 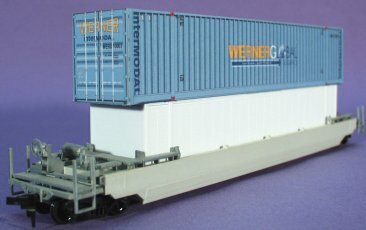 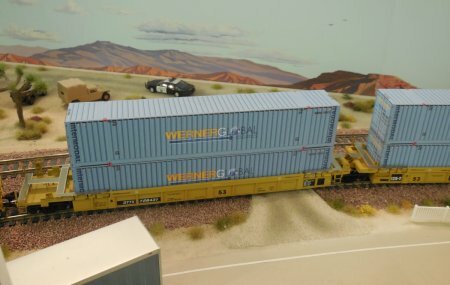 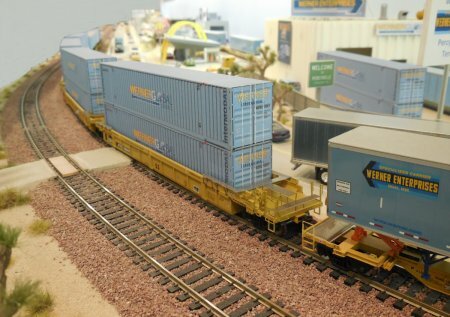 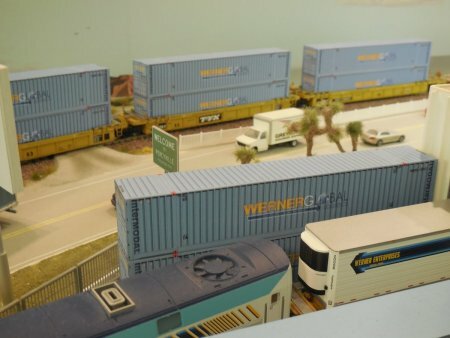 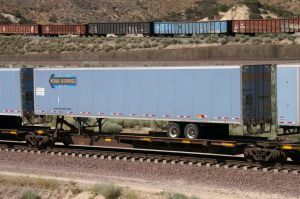 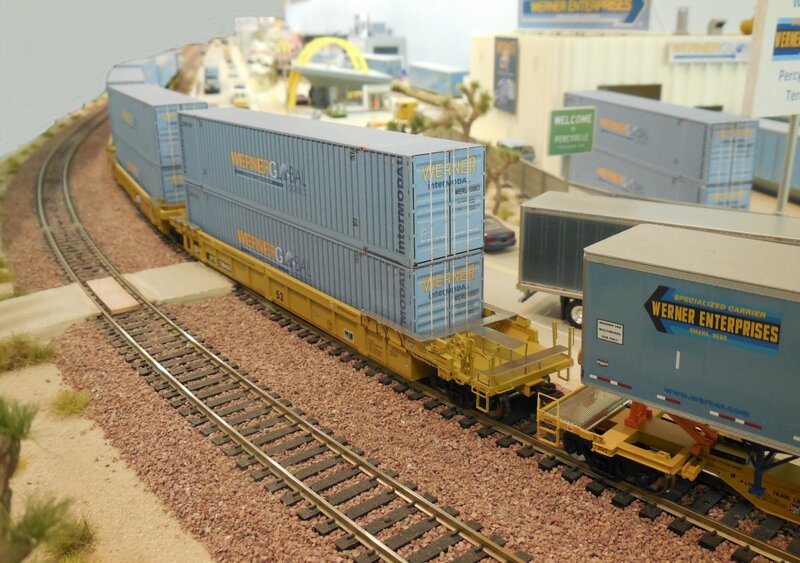 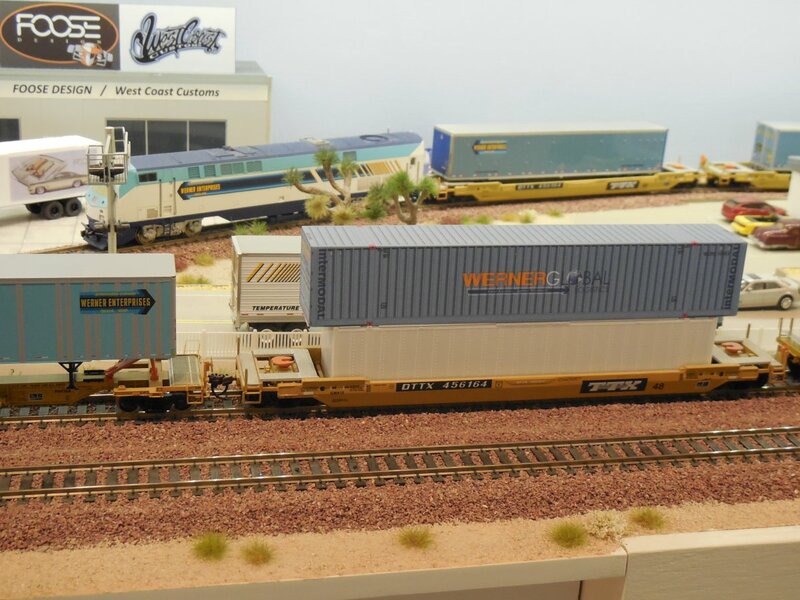 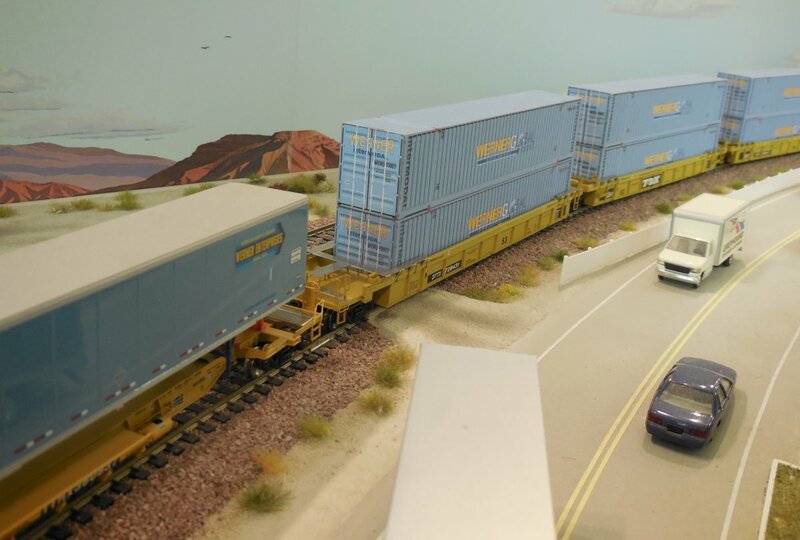 These photos below show real 53' Werner Containers in service. 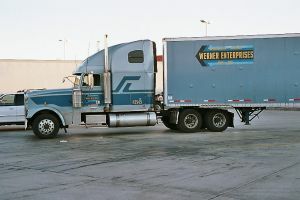 The copyright belongs to the original photographers. 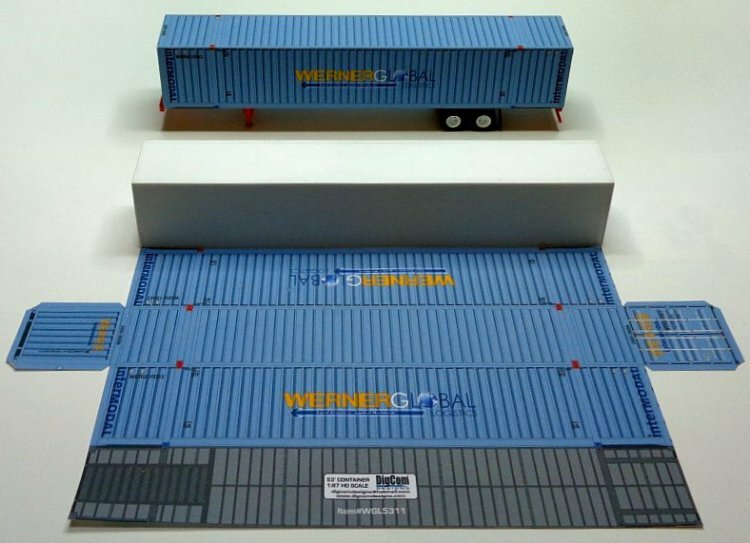 Below are the first samples using the artwork of DigComDesigns just printed on cardboard. 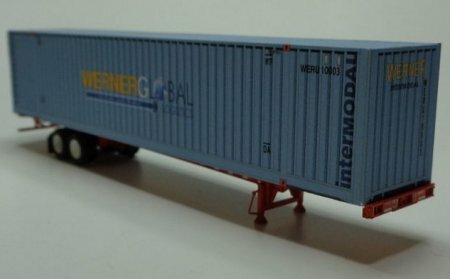 Here is a short introduction, how everything started. 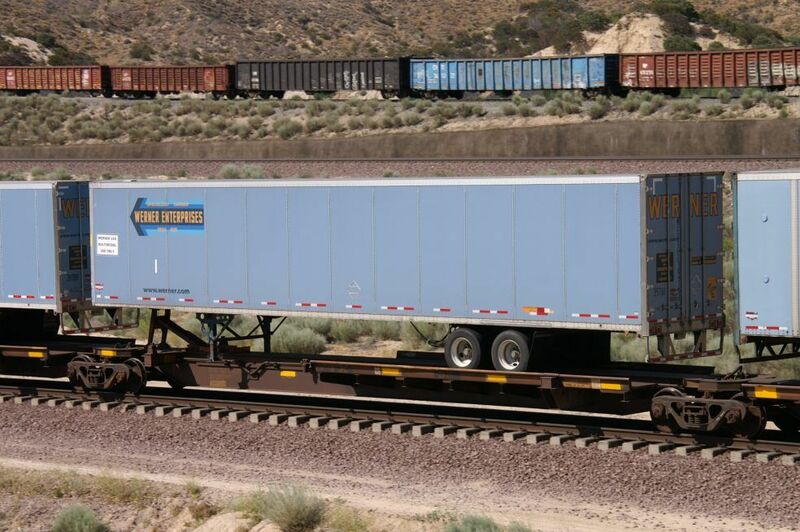 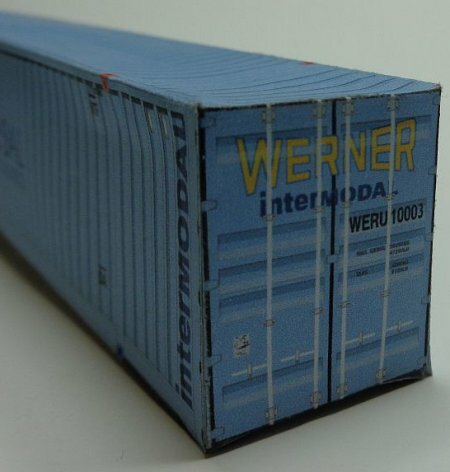 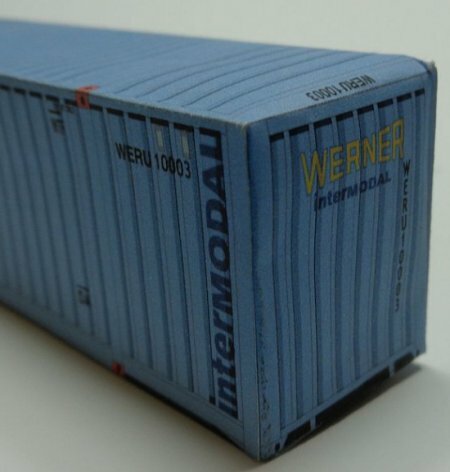 While browsing the internet, I realized that Werner Enterprises got some intermodal containers on rail services. 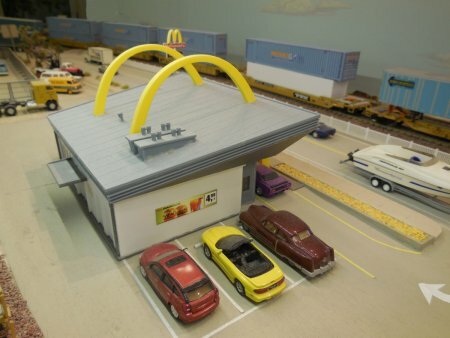 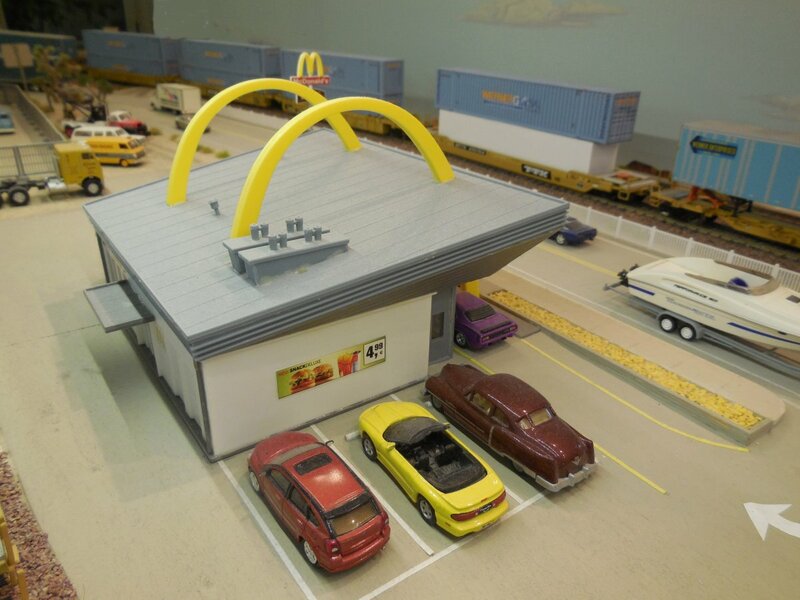 So, I wanted to have some for my HO scale layout to fit my Percyville Terminal of Werner Enterprises. 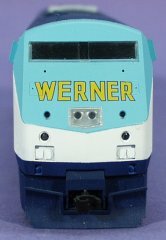 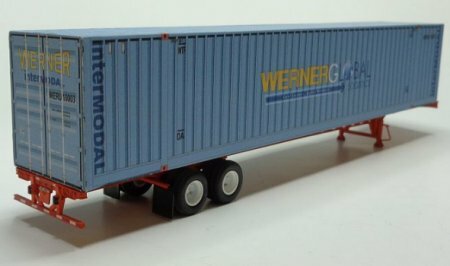 I was asking my friend Pitsch, if he could custom paint some undecorated 48' containers in Werner Blue color and add proper decals. 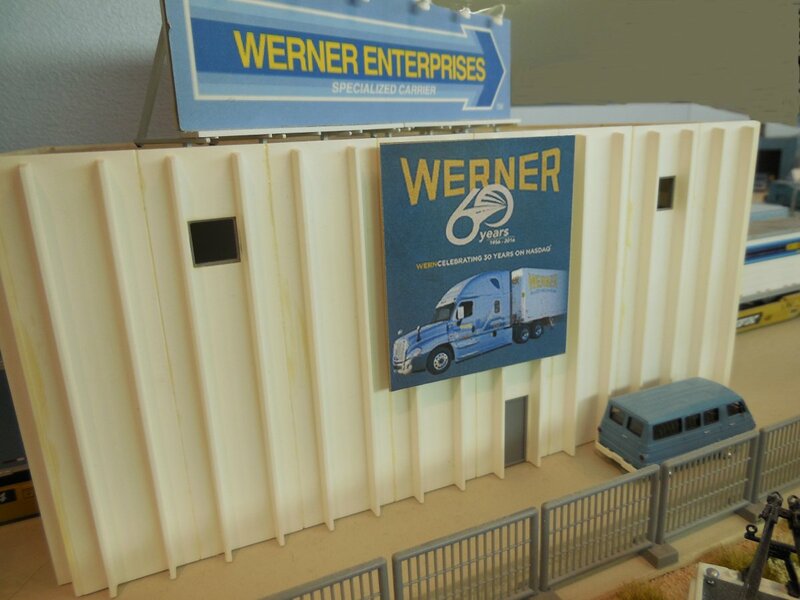 Pat Chaney of Werner Enterprises supplied some artwork. 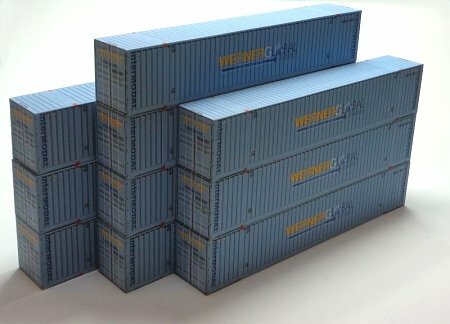 Just before we started, we realized that 48' containers are not correct because they should be 53' long. 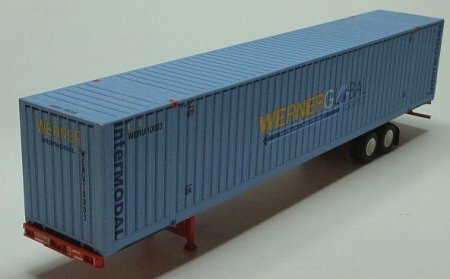 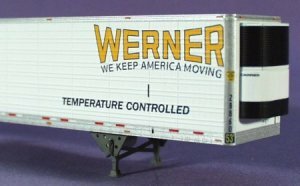 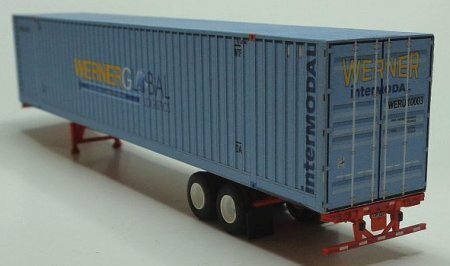 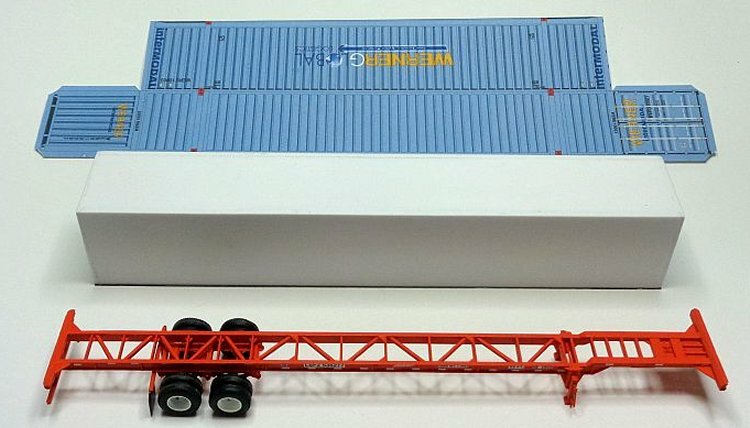 While checking the internet again, we found DigComDesigns, who made the exact artwork for the correct 53' Werner Container. 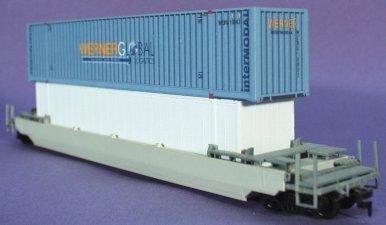 As seen above, the cardboard was not perfect, Pitsch printed it on self adhesive paper and wrapped it around the custom made container body shell (see below). 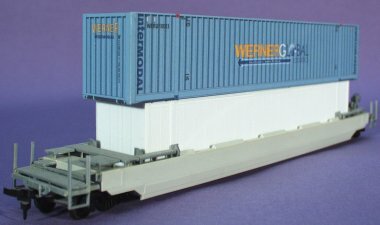 Here is the fnished container sitting on a chassis. (Photos above by Pitsch Allneider) Below, the new Container is on display at a Container Terminal of Pitsch. 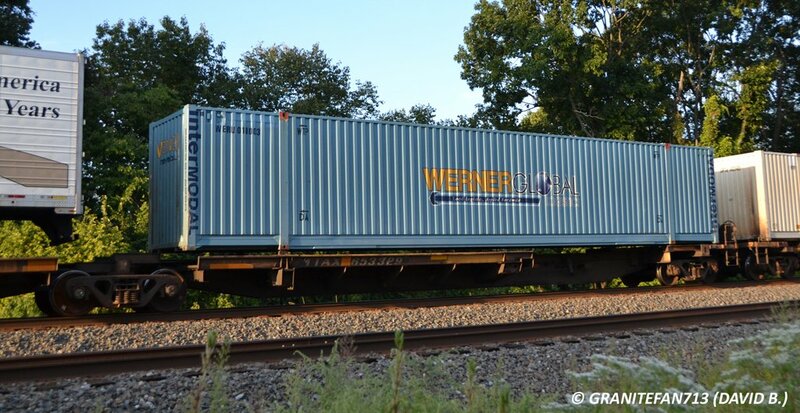 The first new 53' Werner container is sitting on top of a 48' container inside a 48' well car. 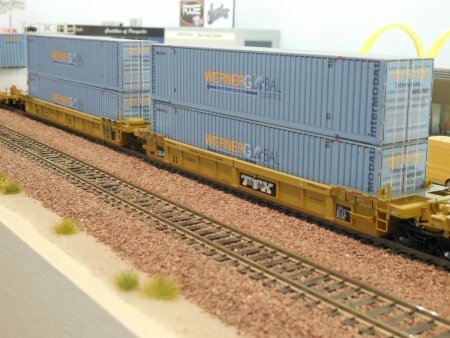 In the meantime, these new 53' Containers made it on my layout. Now, the Werner Diesel Loco was moved thru the warehouse to the Terminal site to welcome the new 53' Containers. 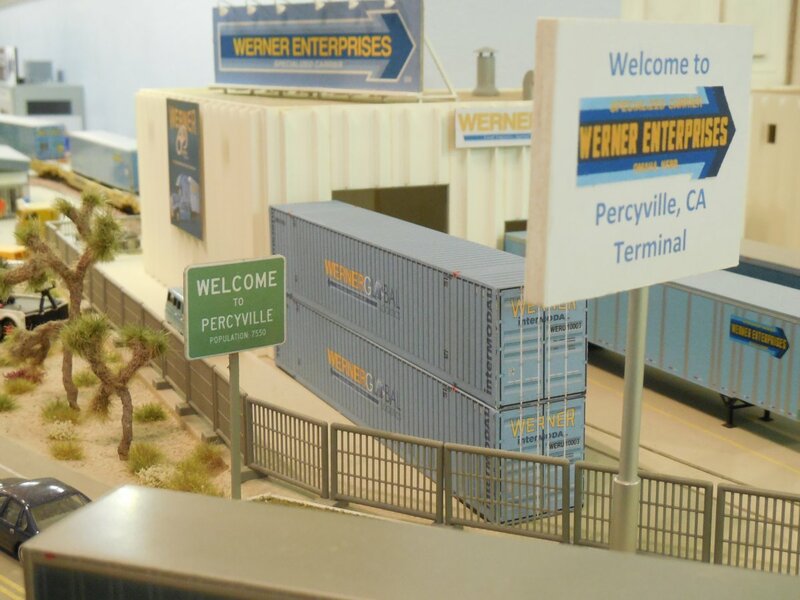 On May 2015, I made a new photo shooting of the Werner Enterprises Percyville Terminal from the air. 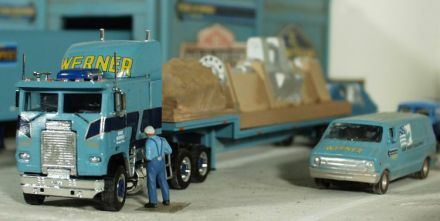 This special trailer was custom made by Pitsch and the pickup truck is a modified River Point model. 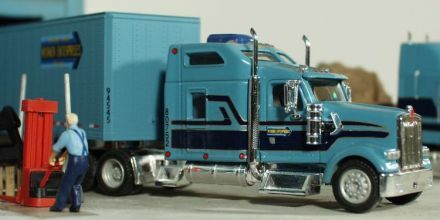 Great job and one of a kind. 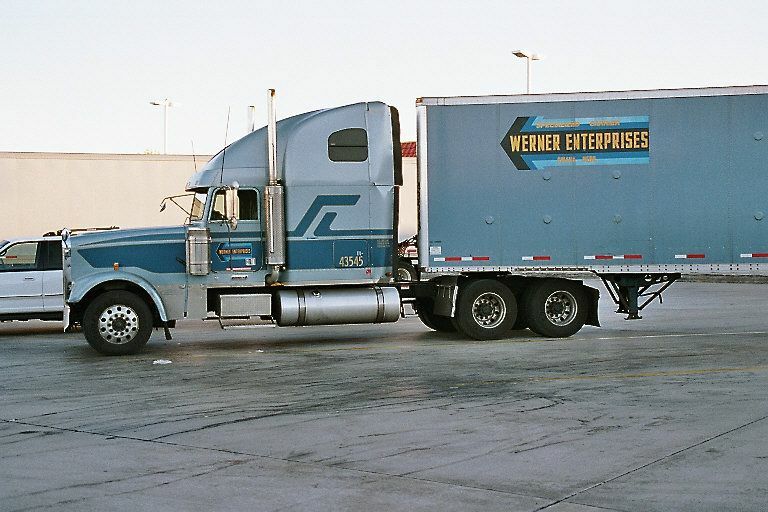 This trailer is not just phantasy because Werner Enterprises did once sponsor a dragster. 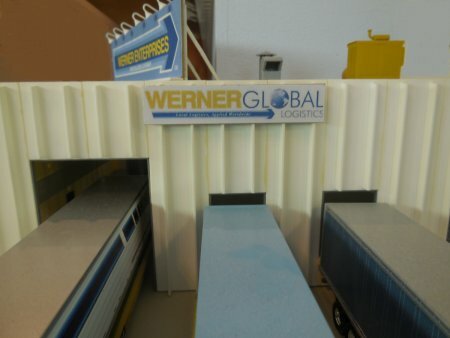 Werner Enterprises got a twin axle trailer, custom made by Pitsch Allneider. 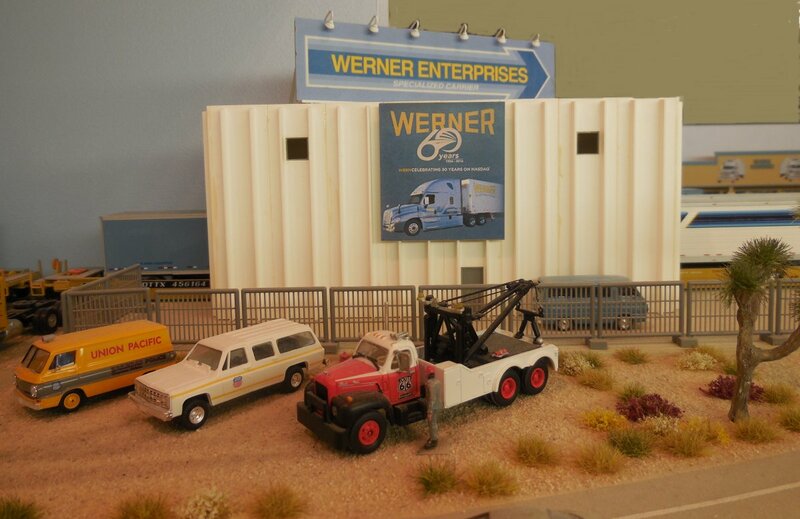 This 1964 Dodge A100 Van (made by Brekina) was from the early days of Werner Enterprises. It sure needs a new Werner decal in front.